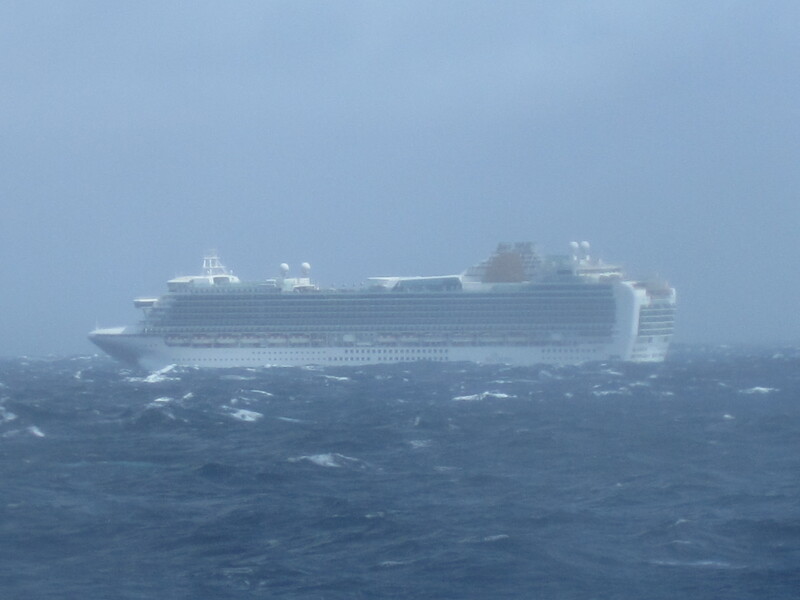 View of P&O Cruises Ventura from Oceana, Bay of Biscay. So my friend and I joined P&O Cruises Oceana on April 24th, looking forward to an exciting 12-night cruise to Gibraltar, Barcelona, Cannes, Livorno (for Pisa/Florence) and Cartagena. When we first checked in we were made aware of an itinerary change, basically they were doing the cruise back to front to avoid an event that was happening in Cannes the day we were supposed to be there. I suppose it was six and two three’s really so on we went through security and onto the ship. As soon as I stepped on board I bumped into Steve, Oceana’s deputy captain. I first met him on Oceana last year when I spent 24-nights on board. We exchanged conversation then I dived in for the killer question, “what is the weather forecast for the Biscay”. Well, I had seen the ships webcam the day before we left and knew it was rough out there but the fact his facial expression changed before he spoke just made it all clear. He said that it was pretty rough, force 9 to 10 winds and the swell was pretty intense. The best part about it though was when he said we would be sailing right into it. 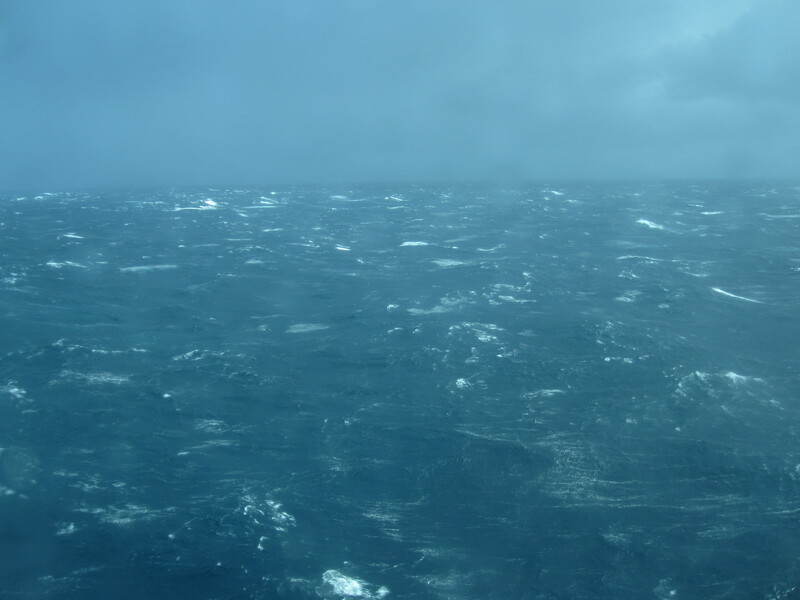 I really do love the rough weather so I was excited, ready and raring to leave Southampton. Roughly 4.30pm we were just about ready to let go our lines and sail out into the Atlantic for what became a Bay of Biscay crossing I will certainly never forget, nor will anyone else for that matter! I don’t feel like we eased into the tail end of a storm then passed right through the heart of it. It really did feel like we just suddenly hit it. The swell was about 28 foot, now that’s no small wave! Think of the height of your house (unless you live in some kind of apartment block of course) that’s probably the height of each and every wave that hit us. Deck 7 was completely covered in water, not just splashes, it was like a small stream, maybe 2 or 3 inches deep so needless to say that was closed. 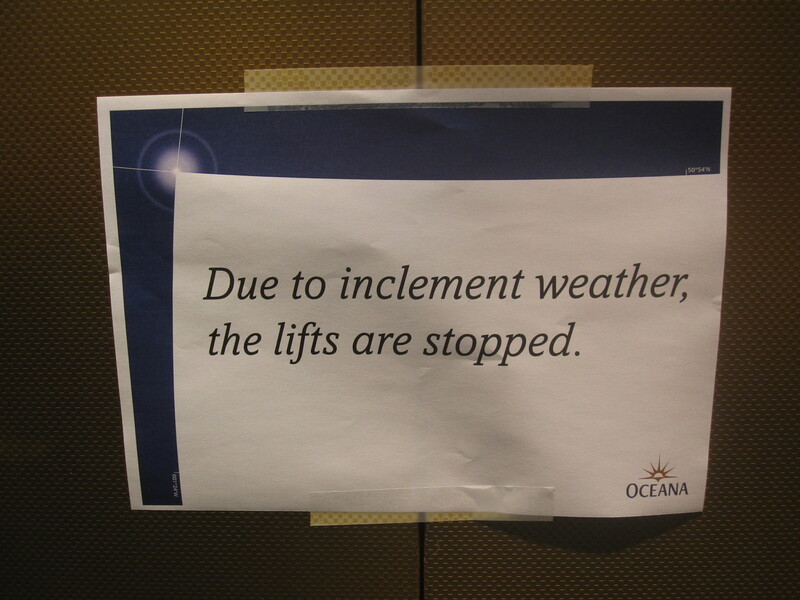 Some of the lifts were stopped for safety reasons; just about all the entertainment was cancelled and trying to move from one area to another, boy oh boy!!! It was like a military exercise. I found myself walking around what seemed like a deserted ship. I think at least half of the people onboard were finding the crossing rather difficult, my friend being one of them. It was surreal walking around this huge ship and finding very few other people, no noise was emitting from the huge arenas on board, everything was silent except from the waves hitting the hull. To describe the conditions, well, there was very little rolling (side to side motion) it was more or less just pitching the whole time. The swell was so large that the entire bow of the ship more or less left the water, the under belly and bulbous bow were clearly visible as we sailed past Ventura whose photography team kindly took pictures of us and well, let’s just say it felt as bad as it looked. Ventura however seemed to be handling it like a pro, she looked far more stable than we did, but then again she is a much bigger ship. Because Oceana seemed to rise so high out of the water, going back down was like being on a rollercoaster, she plunged forwards and deep into the water, creating the most intense slamming effect I have ever felt. You could feel every wave; the movement and vibration were unreal. Our captain, Angelo Vago, frequently re-assured passengers that although it felt very scary and sounded rather unpleasant too that all on board were perfectly safe. He later admitted it was the worst weather he had encountered in 25 years! Think it’s fair to say it was bad then?! I liked the fact he did keep everyone informed as I am sure a few first time cruisers were probably quite concerned about what they had let themselves in for. 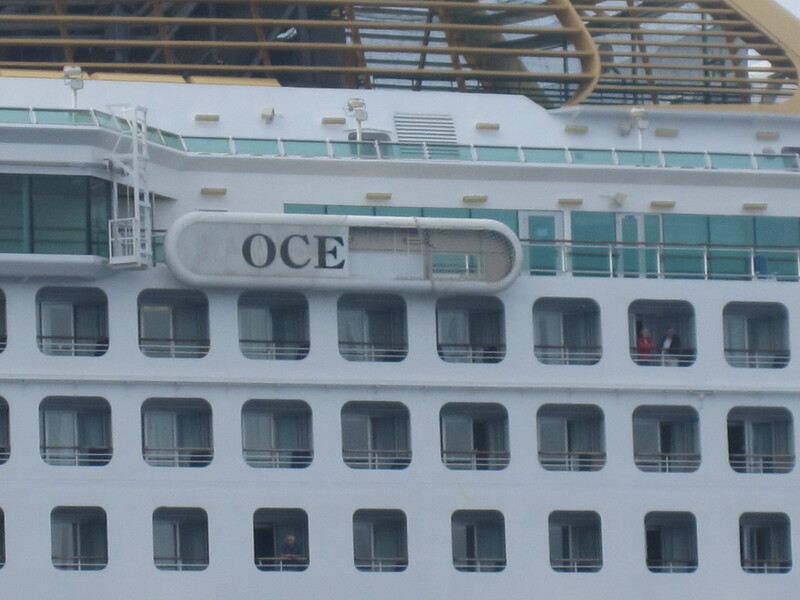 We also were missing half of our port side name signage, she simply became known as OCE as the ANA had been lost……where, I am not sure but it was gone, I have a funny feeling she lost it during her transit back to Southampton to start our cruise. ‹ Back in the U.K.
Really good to hear how you were getting on on Oceana as we were on Ventura when you past her! Looking forward to the next installment. @ Spartan Kent – were abouts is the storm footage? Passed, not past!! Still got holiday brain! Really good to hear how things were for you on Oceana as we were on the Ventura when you went past! @ Spartan Kent – whereabouts is the storm footage? @ Spartan Kent – were abouts is the storm footage? Thankyou for your blog. Oceana took a real beating there! Glad you got your sea legs! !